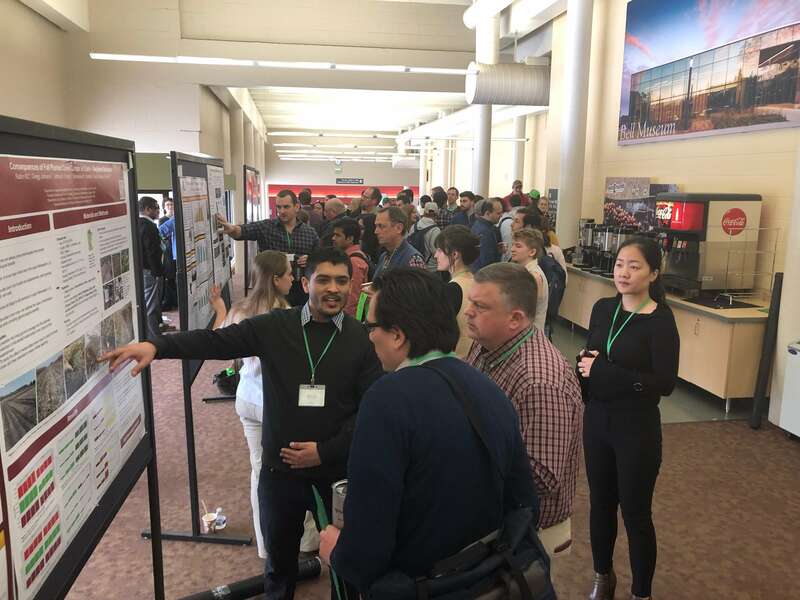 Hundreds of students from both the University of Minnesota and other higher learning institutions attended the symposium, which was supported by the Minnesota Corn Research & Promotion Council. Breakout sessions and a dozen poster presentations showcased the talent and brainpower focused on the challenges faced by farm producers today. For example, Vijaya Joshi, a Ph.D.-candidate from the University of Minnesota’s department of agronomy and plant genetics, worked on weather data models to predict corn and soybean yield. Joshi started the project in his spare time as a way to better understand statistical models. His work to date confirms his impression that among all the available statistical models, plugging this weekly weather data in the Supported Vector Machine Regression statistical model provides the best prediction. With increased precipitation and other changes from past weather conditions, Joshi believes this kind of statistical analysis will become more and more vital as time goes on. Rabin KC, also a student in the University’s department of agronomy and plant genetics, showcased his research on the nitrate-holding capacity of various cover crops. KC focused his project on cover crops that die during the Minnesota winter because this takes cover crop termination out of the equation for crop producers who are already spring planting in a very narrow window. “We found out that the annual rye and crimson clover blend were good at controlling nitrate nitrogen as compared to the no-cover treatment,” KC told a group of faculty and experts visiting each of the posters, “These covers are pulling nutrients that would otherwise remain in the soil after harvest and perhaps go into groundwater. This conference was part of a worldwide series called The Plant Sciences Symposia Series. The aim is to increase the interaction of ag students and faculty from around the world. The Production Ag Symposium is organized by the graduate students of agriculture at the University of Minnesota.